Burnished Reds, Burgundy, Deep Oranges, Tawny Browns, Rich Golds and a Smidgen of Sinister Green……. I am so ready for the seasonal changes that bring these colors out in nature. 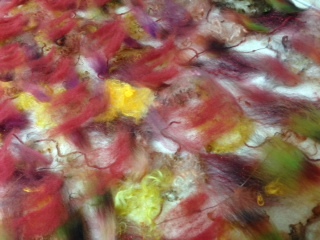 Building a batch of Spinnable FEAST for the upcoming Fiber Festivals in the Pacific Northwest….it is decidedly AUTUMN! I hope to see some of you this weekend at the Clackamas County Fairgrounds for Oregon Flock & Fiber Festival. Celebrating Sweater weather and all things FLUFF related!